Shabbat worship services provide us with the opportunity to welcome Shabbat with moments of peace and joy. Each week we greet one another, connect with old friends and welcome newcomers. Through meditative and participatory singing we welcome Shabbat with the music inspired by the Psalms of Kabbalat Shabbat that express beauty in the world. The Rabbi and Cantorial Soloists help to create an informal and intimate feeling. Meaningful insights, poems and inspirations from our diverse tradition lift us up in prayer and thoughtful divrei Torah, sermons or stories help connect our sacred tradition to our lives in the modern world. Occasionally, we use Visual T’filah to enhance our prayer experience through the use of visual kavanot that bring direction to our prayers. 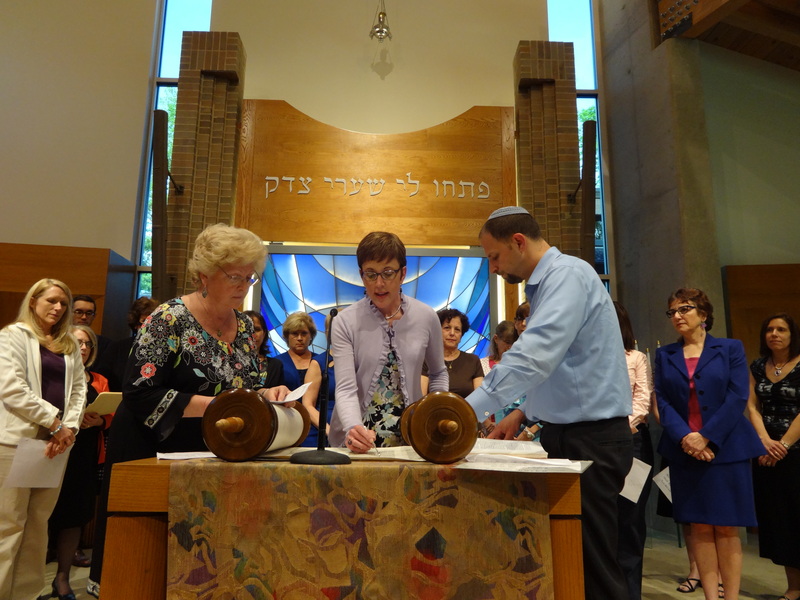 Beth Tikvah is affiliated with the Union for Reform Judaism (URJ) and uses the prayer book, Mishkan T’filah, which contains instructions and commentary to meet the needs of all congregants. Services are led in a combination of Hebrew and English. Our prayer services are held in our beautiful sanctuary every Friday evening at Beth Tikvah. Times vary depending on special services, such as, Shabbat Alive or Tikvah Tots. Following services a sweet Oneg Shabbat, sponsored by members, offers an opportunity to enjoy light refreshment and socialize with other congregants. In addition, congregational Shabbat dinners are held throughout the year as a way to allow individuals and families the opportunity to share in the celebration of Shabbat with the Beth Tikvah community. Shabbat Vayinafash is a Shabbat filled with peace, meditation and reflection. Beth Tikvah’s instrumental musicians, provides accompaniment for our soloists in this service held every two months. Beth Tikvah’s congregational adult choir, the Shironim, provides musical leadership in this monthly service. The choir presents music for congregational participation as well as contemplative reflection from both traditional and contemporary Jewish music sources. The Shironim Shabbat services seek to inspire and elevate prayer through the power of vocal music. Our youngest congregants are introduced to the festive nature of Shabbat at this special service and program where story telling, singing and child participation are the focus. This short service is geared to children 8 and younger. Tikvah Tots programs are held on selected Friday evenings beginning at 5:45 p.m. Religious school students in grades 3-6 lead the congregation in prayer during these services held four times during the religious school year. Through readings, teachings, and songs led by the students, this service reflects the youthful vision and spirit of Shabbat. The Shiranotes (youth choir) also perform at these services. Shabbat Morning Services are held on dates designated for our B’nai Mitzvah students and are open the congregation. Shabbat services begin at 10:30 a.m. and are led by both the Rabbi and B’nai Mitzvah. Check the calendar for upcoming service dates. Beth Tikvah is excited to introduce a new Saturday morning prayer experience. One Saturday a month you are invited to join Rabbi Rick for a highly-participatory, guitar-led Saturday Morning service from 9 – 9:45 a.m. Stay for a discussion of the weekly Torah portion from Hasidic and Spiritual points of view from 9:45 – 10:30 a.m. Check the calendar for upcoming service dates.